The Shelbourne Hotel in Dublin opened in March 2007 after an extensive 2-year renovation, and Executive Chef John Mooney joined The Saddle Room in January 2007, after an impressive international career honed at some of the top restaurants around the world working with the crème de la crème of chefs beginning in his hometown of Chicago, Illinois before continuing on to the Mansion on Turtle Creek in Dallas, Texas, Raku in Bethesda, Maryland, at Heartbeat in New York, and at PURE in India. Having Irish heritage, Chef Mooney has come full circle working in Dublin. 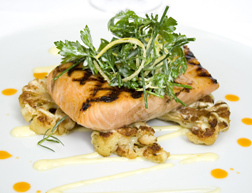 I stayed at the hotel in September 2007 and had the opportunity to experience Chef Mooney's creative modern cuisine including his "Gin and Tonic" Grilled Salmon with Caramelized Cauliflower, Lime Emulsion, and Coarse Herbs, and persuaded him to share this recipe as well as two others. Method: Place the pear syrup and pear vinegar in a small mixing bowl. Whisk in the lemon olive oil and set aside. 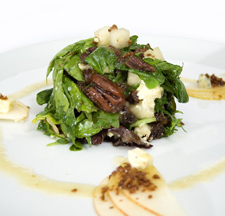 In a large mixing bowl, combine the greens, honey pecans, and currants. Sprinkle over with the blue cheese and then drizzle over with the dressing. Toss the salad gently and briefly, as you do not want the cheese crumbles to begin sticking together. Divide the salad onto the centre of the chilled salad plates. Garnish with sliced pear fans. Method: Cut the cauliflower ½" thick. Place the cauliflower in a medium sized saucepan lightly coated with oil, over moderate heat. It is best to place another pan on top of the cauliflower to allow for even caramelization. The pan must not get too hot or the cauliflower will burn and not caramelize. Garnish with the coarse salad. Method: Roll out pastry. Sprinkle with icing sugar on top and caramelize the puff pastry under the salamander (broiler) until the pastry reaches a nice caramel color. Method: Mix all of the ingredients together and bring to the boil. Store in the refrigerator for at least 3 hours before serving. Method: Mix all of the ingredients in a baking tray. Bake in a pre-heated oven at 160°C (320° F) for 15-18 minutes. Use the cooking juice for coating the fruit. 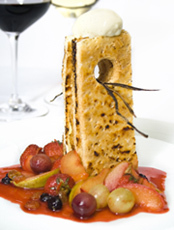 Read other articles on The Shelbourne in the Hotels and Resorts, and Restaurants sections. Please read other articles on Ireland in the section including: County Cork and County Wexford, Ireland and County Clare and County Kerry, Ireland, Hotels and Resorts, Restaurants, Chefs' Recipes, Spas, Liquor Cabinet: Celtic Crossing Liqueur, Boru Vodka, Knappogue Castle Irish Whiskey, Fashion, and Adventures sections.